As I see yet another massive lorry trundling down the Udimore Road at great speed, or trying to get around the roundabout by Strand Quay in order to head along South Undercliff, I wonder how ready we are for Brexit and what impact it will/can/may have. Some businesses have clearly been preparing for many months as TV reports have shown them adding storage space and building up stocks – just in case “just in time” deliveries are not in time. Yet Kent County Council was being criticised this week for the money spent on roadworks in case Brexit led to major traffic jam – such as the very recent minor jams (oh, just a few thousand lorries) as a result of winds in the Channel stopping sailings, and industrial action by French customs officers slowing things down. And the question I asked myself is what will lorry drivers do if the motorways are jammed up? Some already clearly already try to avoid London and obvious motorway routes by coming through us – with the result that in recent memory one Hungarian juggernaut got trapped at the very bottom of the Valley Park estate. 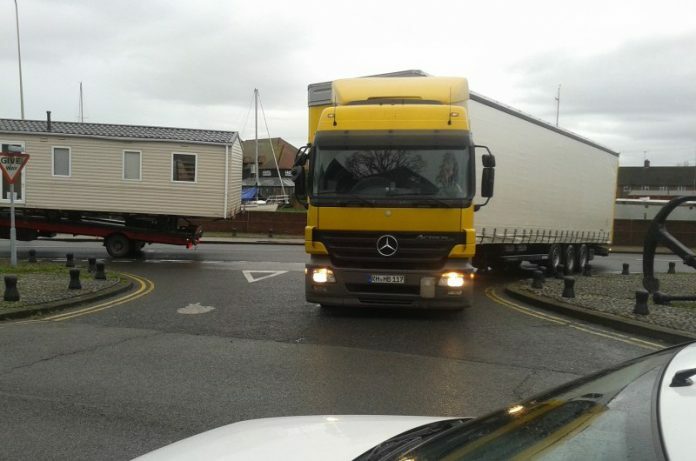 And I’m sure others have other stories – of lorries getting jammed on the corner opposite the Landgate etc. However the usual “emergency” advice is not much help as a lot is focused on situations (floods, fires and similar threats) where you have to leave your home. However one general tip is helpful. If in doubt, stay in, and listen to the radio – preferably one with a battery as our imports include much of our daily energy use – so you know what is actually happening. Another bit of advice (sensible at most times) is also have spare medicines and food in the house as you never know when you might not be able to get out – and even telephone systems (cable or aerial) can go on the blink. This can happen to me (as my lungs are marginally useless and the slightest cold or wind keeps me indoors) so I’ve usually got enough inhalers in my house ….. and a certain amount of instant non-perishable food so I don’t starve. And no-one can actually predict what may happen as a result of Brexit. But if businesses are planning ahead, as is Kent County Council, perhaps this is something we should all think about. One must feel sorry for residents who live around south undercliff, which is a fatality waiting to happen,on a narrow and dangerous road,not helped by motorists parking on the blind bend, sadly we had a chance of a bypass 30 years, with several options turned down,thanks to the nimbys who have mostly passed on,and now everybody living on the a259 trunk road, have to suffer,thanks to the inconsideration of others.